The Hub is a section of Aperture Science that is featured exclusively during the Cooperative Testing Initiative. Through the Computer Intelligence Training and Enrichment Center Human Test Subject Research Center, or CinTech (pronounced Sin-Tech), Atlas and P-Body can access the various test chambers that are featured throughout the coop campaign. It features a large screen that displays the total steps players have taken since starting co-op, as well as total portals fired and other statistics. Additionally, it has Aerial Faith Plates, Hard Light Bridges, and Panels that allow for easy traversal of the chamber. After you complete the final course, Mobility Gels, the Announcer then speaks to the players in the Hub. This will happen even if one of the players has not completed co-op mode. 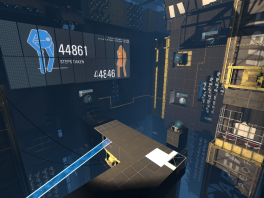 As such, one player will miss out on GLaDOS' story-related lines and the unique "new area unlocked" animations that this map plays when neither player has completed a part. This also occurs if the game is a local split-screen session where all chambers are automatically unlocked. ↑ "Portal 2 split screen coop NOT saving progress"
An overview of the Hub. This page was last modified on 8 May 2017, at 09:56.